There is a housing bubble in Canada and I am not the only one who thinks so. Recently Canso Investment published a report on the Canadian housing market and I urge you to read it. In case you don't have time to read 16 pages of arguments then I suggest you skim through my quick summary of the report with graphs. Canadian mass media tends to publish conflicting opinions on the housing market which leads to the public being confused as to where the market is heading. Canadian real estate is some of the most expensive on a variety of measures. 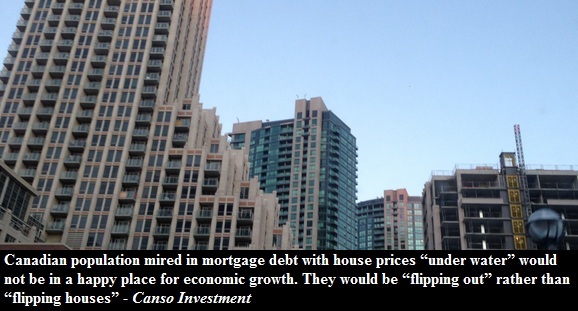 The Canadian housing market is a speculative mess which is about to come crashing down. Canadians will suffer withdrawal symptoms from insured mortgage credit. In 1988 the federal government insured about 30% of residential mortgages. The latest amount is 75%. In 2003 CMHC removed the maximum $250,000 insured residential maximum. Only in 2012 did CMHC introduce a new insured residential maximum of $1,000,000. If CMHC reinstated the original $250,000 maximum (inflation adjusted number would currently be $300,000) guess what that would do to the Canadian housing market where the average home price is above $380,000. Thus it was the availability of credit, not the low interest rates, that caused the recent hot housing market. Probably the strongest enabler of the Canadian housing bubble was the automated appraisal system developed by CMHC called EMILI which streamlined the process of mortgage insurance. EMILI can be easily tricked to make the value of the house whatever you want it to be. 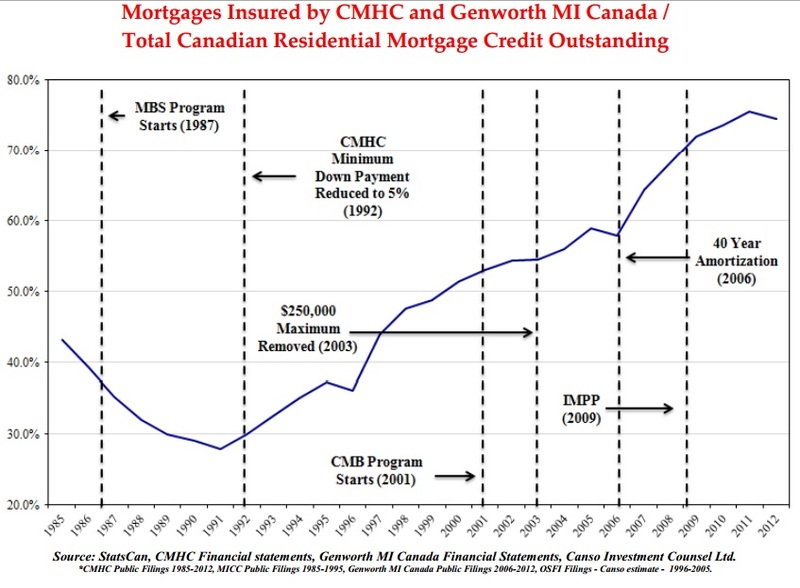 CMHC was insolvent after the early '90s housing bust and was bailed out by the government. How bad will it get this time? Very bad! The Toronto condo market is a runaway train. A lot of demand for Toronto condos is from the real estate agents themselves. Most condo investors focus on price appreciation. The problem with this approach is when the appreciation trend reverses and leads to a cascading effect. There's evidence of entire floors of buildings being sold to foreign investors. Foreigners investing into Canadian real estate is like Russians investing into the banks of Cyprus - it's not exactly the most stable form of investment. People want to believe in the Canadian miracle of banking and real estate. No wonder CBC recently ran a story which stated that "Canadian Housing Slowdown is Over". This is very typical for the market top. Current federal debt is $676 billion. Provincial debt is $512 billion. The $900 billion in mortgage insurance backed by Ottawa is not a trivial matter. 30% of the Canadian economy is directly and indirectly depended on the real estate industry. Once the market turns south, the problems will spill into the other sectors of the economy.